To support the Relational Change Charter and Statement of Principles and the ongoing development of our core values and associated practices we assist in establishing a number of regional Relational Communities of Practice, (RCOPs). Traditionally COPs, (Lave and Wenger, 1991), bring together people who share values and seek mutual support to make positive change in their organisations and/or communities. They can meet 'virtually' or physically. We add in a relational practice designed to aid empathic bonding and also coaching strategies to facilitate action. Participants of RCOPS, (usually about 7 to 12 people) meet regularly to deepen their leadership capacity, think creatively about local projects and plan actions for positive change in their lives, work, organisations and communities. These groups are not new phenomena and build upon indigenous story-telling practices and theories of 'community inquiry', (Shields, 2003). RCOPs provide an opportunity to learn and develop new skills and practices to support change in communities. Public Dialogue is one such practice for engaging groups and communities in conversations about essential shared issues. For example, neighbours who have formed a Neighbourhood Watch program may be having trouble getting the needed level of involvement. Communities face issues concerning different stages of life: how to best support new parents, troubles with teenagers, ageing, isolation, dealing with loss and bereavement, creating more supportive organisational environments and leading training/capacity building projects. Professional groups want to share best practice and communities want to engage all members in active change processes; all are suitable foci for an RCOP. We believe such issues are more profitably addressed at a group/community level than by individuals: it is easier to sustain motivation, engagement and action if responsibilities and leadership are shared. At Relational Change we offer organisational consultation and development aimed at radically engaging communities, employees, leaders and customers in change work. We offer a variety of dialogue approaches (such as Open Space, World Café, Appreciative Inquiry), plus peer coaching and story telling practices designed to support empathic resonance that can facilitate engagement and group solutions. We can support members of the RCOPs in developing these skills by providing consultancy from experienced RCOP leaders. If you are interested in joining or creating an RCOP, or hosting a public dialogue within your own community or organisation, please contact Helena Kallner at helena@relationalchange.org. 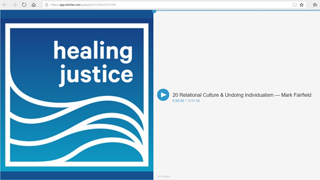 Mark Fairfield: "Relational Culture and Undoing Individualism" –The Healing Justice Podcast 2018. Mark Fairfield speaks about the central role of connection in our lives and lethal individualism. We learn about relational culture, factors for resilience, his work supporting caregivers in the AIDS movement, how bullying is a euphemism, and failure. Mark Fairfield: "Sharing Resonance" –The Healing Justice Podcast 2018. Mark Fairfield introduces an exercise called "Sharing Resonance" It is a framework for building relational culture and dismantling individualism in our relationships and groups. This episode is more of a training and intro to how to share resonance, so you can listen on the go and learn the practice wherever you are... and then take it into relationship and practice it with one or more others. We especially recommend starting with groups of 3-5. Moving towards more supportive fields: COPs, CANs and RCOPs , Denham-Vaughan, S. and Clarke, M., British Gestalt Journal , (2016) 25, (2), 20–32. This paper defines three varieties of community/team organising and the relationship of each to Gestalt practice. SOS: A relational orientation towards social inclusion , Denham-Vaughan, S. and Chidiac, M-A. 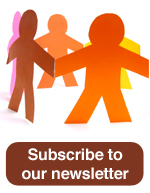 Mental Health and Social Inclusion , (2013) 17, (2), 100–107. This paper describes the contextual formulation of the term "Relational" used by the co-founders of Relational Change. The Relational Movement , by Fairfield, M., The Relational Movement, British Gestalt Journal , (2013), Vol. 22, No. 1, 22–35. The Rise of the Enabling State: A review of policy and evidence across the UK and Ireland , by Jennifer Wallace, – published by the Carnegie Trust UK , 2013.